The Fortifications on the Caribbean Side of Panama: Portobelo-San Lorenzo form part of the defence system built by the Spanish Crown to protect transatlantic trade. They are magnificent examples of 17th- and 18th-century military architecture. The forts, castles, barracks and batteries of Portobelo created a defensive line around the bay and protected the harbour; the works at San Lorenzo guarded the mouth of the Chagres River. Portobelo and San Lorenzo were Spanish fortifications on the Caribbean coast of Panama. Portobelo even was the most important Spanish port of Central America in its time, the storehouse for the silver and gold that came from Peru by land or sea/river and had to be transported across the Atlantic. Both sites lie on either side of the modern city of Colón, some 80 km apart. As most others, I only visited Portobelo. I would love to see a review of San Lorenzo on this website too, but it isn’t as easily accessible. Without a rental car, your only chance is joining a day tour from Panama City. The pricing of these tours (of any guided tour from Panama City) is ridiculous: they all seem to start at 100 US dollar. That’s the downside of Panama: due to the cruise public, a large number of western expats and the general Americanization of the country prices often bear no relation to real costs. Fortunately Portobelo can be reached by public transport. It cost me 5 US dollar each way, with a change of buses at the town of Sabanitas. Taking this route, you avoid Colon which has the reputation of a hellhole (though that might be an exaggeration too). Sabanitas is easy and friendly, and Diablos Rojos race by frequently to take you to Portobelo. I wasn’t the only tourist on this bus, nor in the town itself. On approach you immediately notice the formidable natural harbour, which even Columbus acknowledged. It reminded me a bit of the Bay of Kotor. 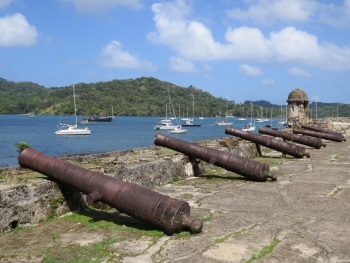 There are several fortresses and other military structures around the harbour of Portobelo. One of the most prominent lies in the center of town: the San Jeronimo Fort. It looks quite OK from a distance, maybe weathered but considering its age and Panama’s climate that is no surprise. Upon entering, I noticed there are no access restrictions. Everybody can walk in as they like, and have a party inside (I saw many empty liquor bottles!). The niches are of excellent use for kissing couples. Later on I saw two caretakers picking up the trash, so there is some form of maintenance after all. The effects of the flooding of 2011 are still there: about a third of this fort still is flooded. You can only reach the far end by crossing on two well-placed stepping stones. No health and safety standards here! Even the text on the information panel has faded away. But, in spite of all of this, this fort and its setting at the harbour has real charm. Everything shows the effects of time, but that’s more convincing than so many other fortresses and castles on the List which have been overly restored. On a prime location lies the former Customs Building. Birds have taken over the top floor for their own use, the ground floor houses the city museum which should not be missed. An introductionary video is shown about Portobelo’s history. I found it difficult to get online information about the site beforehand, also the AB evaluation is very short and superficial. The site seems to be surrounded with myths. The video emphasizes the role slaves played in its construction. The focus is not so much on the story of the Spaniards and the English, but on that of the local population that is mostly from African descent. The site has been on the List in Danger since in 2012 mainly due to neglect: environmental factors, lack of a maintenance programme and polluted water has lead to deteroriation of the site. There are even families living in the inner areas of the Santiago de Gloria Castle, though new houses are said to be currently under construction. The town seems to be too far away from Panama-City to attract the much-needed attention. It's still worth a detour to visit however. Both sites visited just recently (November 2017) with a rented car as that is the only possibility to reach San Lorenzo castle without participating in expensive organised tours. From Colon one should folow the signs to Gatun Locks or Agua Clara (which is a new part of extended Panama Canal next to Gatun Locks). So far crossing Panama Canal is possible only through the Locks (althoug a new big bridge over the Canal is visibly going to be built). The passage is occasionaly closed due to ships going through the Canal but the crossing usually does not take longer than half an hour. After the Locks there is an asphalted road towards Fuerte Sherman (there is a checkpoint where you should tell you are going to Fuerte San Lorenzo). A few km before the castle there is an official entrance to San Lorenzo Protected Area (5 USD per person for foreigners). The fort itself alhough it was detroyed by Morgan and other pirates looks much better preserved than Portobelo fortifications. Full layout is still visible as well as the moat cut in the rocks. There are excellent views from castle walls (Rio Chagres, Atlantic coast). And because of relative difficulty to reach the site it is substantialy less crowded than Portobelo. I just returned form a visit to Portobelo(Feb. 2011) The heavy rains have taken a toll on the whole area. The road to Portobelo, still had several damaged spots that slowed down traffic. The town of Portobelo had had several house destroyed by landslides with loss of lives. The Fort also suffered damage form the landslides. Parts of the wall had collapsed and huge tree trunk were still in the process of being removed. The site was undergoing repair and restoration. All in all, it is a beautiful site to visit. Portobelo is a nice site but nothing more than that. Trash, not well preserved, dangerous roads full of buses that run without any speed control. If you go there, go in dry season and beware of rural "diablos rojos" (red evil buses). Panama has quite a lot going for it as a tourist destination – excellent bird watching and diving, the San Blas Islands (run as an autonomous province by the indigenous peoples), several colonial historical sites plus the incomparable Canal (which is not a WHS but should be even though it is not even on the Tentative list). If you have time it IS worth the detour to go the 50kms from Colon to Portobelo. This sleepy village was at one time a pivotal location within the Spanish Empire for the transport of gold to Europe, lying as it did at the Atlantic end of a stone highway from Panama City. I quote :- “Portobelo was the port of entry and of exit for all of South America. The exchange of merchandise took place annually at Portobelo in the form of a fair which lasted from 30 to 60 days. During this time, this sleepy little place was a beehive of activity. Transactions frequently totaled from 10 to 12 million gold pesos. These fairs took place once each year until 1738 when, as a result of continual attacks by pirates, Spain was forced to abandon the Isthmian route for the longer but more secure one around Cape Horn. The frequent pirate attacks forced the Spaniards to adopt a convoy system. Each year two fleets of 40 to 70 ships sailed from Spain, one bound for Veracruz, the other for Portobelo. The arrival of the fleet signaled the opening of the great fair." For the English (and perhaps for others too) this spot has the added interest of being the burial place for that well known “state supported” pirate Sir Frances Drake (he who “singed the king of Spain’s beard”)! In 1596, after a failed expedition to cross the Isthmus and raid Panama city for the gold which had been collected there for transportation to Europe, he died of dysentery and was buried at sea in a lead coffin. 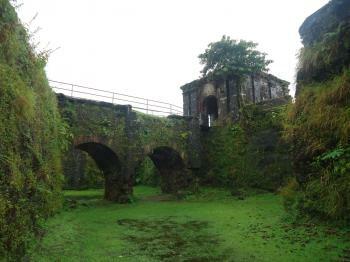 As you will see from the photo, the ruins of the fort (then the height of military sophistication) are quite well preserved and the situation of the port among green islands and hills is very pleasant. Just relax, let your mind wander and try to imagine those far off days and the impact this place had on world history . "site .. is deteriorating at a rate which could undermine the outstanding universal value for which it was inscribed." Frequent buses travel the route between Colón and Portobelo. From Panama City, you can meet them half way in Sabanitas. Fort San Lorenzo lies some 8km west of Colón, and can only be reached by car or on an organized tour of the nearby Gatun Locks. Liquid Mercury: Portobelo: Was the transit port for Liquid Mercury from Almaden. "The materials that were traded were silver, mercury, among other precious metals and rich commodities." Christopher Columbus: Columbus is said to have named Portobelo "Puerto Bello" in 1502, when he stopped in this harbour on his 4th trip to the New World.